With the discovery by 'Steven Goddard' and recent confirmation by Anthony Watts and others of 'fake data' and 'up-justed data' rife within the US temperature datasets, I'm reposting this December 2013 post on More NASA GISS temperature tampering, this time in Iceland & surrounding subarctic, illustrative of the data tampering/mishandling worldwide. 12/17/2013 by CG Ribbing . In this guest post, Magnus Cederlöf shows how GISS "homogenized" a constant temperature from the 1950's - 2000's in Iceland to a rising temperature. One is amazed at the craftsmanship! Several blog posts have dealt with temperature adjustments GISS for Iceland. See eg CG Ribbing post here or this from wattsupwiththat.com. 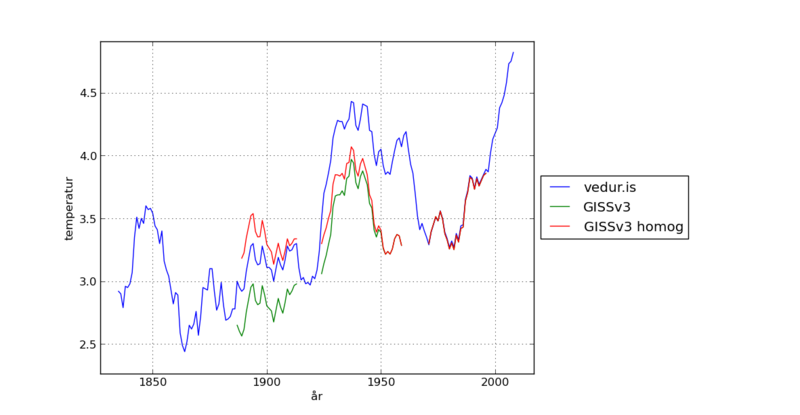 I'll do this one more posts on this topic, where I compare the temperature series as Iceland's meteorological service (vedur.is) provides with those from GISS. GISS (Goddard Institute for Space Studies) is a research institute under NASA. GISS focuses on climate science and provide blah graphs and maps of temperature trends. The problem is that GISS has adjusted down the 1930's to 1940's warming period of the Icelandic temperature ranges. By doing so, it looks like the temperature has risen unnaturally over much of the past century. Using the Iceland National Weather Service data from vedur.is as the source, the development of temperature in Iceland is as follows. The upshot of this is that GISS has lowered 1930's-1940's warm period in all temperature ranges. One could imagine that homogenized data so that some stations may be increased temperature and reduced temperature. But that is not the case. However, the curves show that the G SHARP call homogenized both reduced and elevated temperature if compared with the data from the homogenized series G SHARP. There are also significant gaps in the GISS data. These gaps are not in the data from vedur.is. GISS shows that the temperature rise in most of the Iceland should have been between 0.5 and 1 degrees. Iceland's own weather reports now show that the temperature increase between these years was zero . This image from GISS is understandable to the uninitiated, but it is also completely misleading. It is not only that Iceland is wrong. Presumably, the error propagated to a large part of the ocean around Iceland. One can then also wonder how many other areas that have similar errors. * Footnote: There are two temperature ranges for each station on vedur.is. One very long time series, but ends in 2000, and the other has shorter time series and ends about the year 2008. These data sets are merged, although they do not have exactly the same values ​​for overlapping times. The difference is within a few tenths of a degree and therefore does not affect the conclusion of the analysis. Temperature data for "GISS homogeneity adjustment"
The top right graph in red is the raw data, which looks like the graphs shown here, with a cooling from 1940-1980. The graph below that (yellow) is the adjusted data, in which that cooling has disappeared.